We’d love your help. Let us know what’s wrong with this preview of Practically Investing by Coreen T. Sol. If the last financial crisis cost you money, you may be wondering whether you should continue investing in the market. After all, you have bills to pay and a job to keep-and you can't spend all your free time crunching numbers. With the help of an expert, you can control your financial future by making small shifts in what you are already doing. Author Coreen T. Sol, Charte If the last financial crisis cost you money, you may be wondering whether you should continue investing in the market. After all, you have bills to pay and a job to keep-and you can't spend all your free time crunching numbers. write your own investment policy statement. To ask other readers questions about Practically Investing, please sign up. I was alerted that I won a copy of this book but it never did arrive, why? I received this book for free through a Goodreads giveaway. As a CGA, Practically Investing was a quick refresher of basic finance; to someone with little or no financial knowledge, I could see this book as being a very daunting read. Similar to a textbook, Practically Investing was laid out with logical chapters, building on content as the book progressed and often referring back to previous chapters in order to more fuller grasp terminology. The real life examples although very simplistic helpe I received this book for free through a Goodreads giveaway. Similar to a textbook, Practically Investing was laid out with logical chapters, building on content as the book progressed and often referring back to previous chapters in order to more fuller grasp terminology. The real life examples although very simplistic helped to illustrate concepts, and the random one-liners and sarcastic comments were much appreciated. Practically investing by Colleen Sol is an informative guidebook on controlling your financial future. It covers a wide range of topics some quite technical. The writer does a good job of trying to explain these areas with examples and stories to make it understandable to the reader. A very useful glossary is also included. Worth reading no matter what stage of life you're in. A goodreads give away thank you! I finished this book last year, and have gone back to it a few times for reference. I liked how the author explained the financial world, and made investing easier to understand. I appreciated the glossary as it helped me with all the financial terminology that I heard about but had little idea of what it was. I thought it was a very interesting read, and anyone who is looking for more financial knowledge should enjoy this book. I received this book for free through Goodreads First Reads. Thank I finished this book last year, and have gone back to it a few times for reference. Good guidebook for anyone wishing too set up an investment plan. Comprehensive glossary of the terminology that is used in the financial market and as such is a great book to have at hand. A large amount of information so I would suggest keeping it on your bookshelf but definitely a read one should do before looking for a financial manager. Still slowly readings as I'm reading to learn. Completed first four chapters and value the information already covered. Finished reading the book today. I learned a lot more about investing on top of what I already knew. It reinforced what I already knew. Chapter 5 on pooled products was of particular interest. The format and writing style made a dull subject interesting and easier to understand. For this reason I'll be passing the book on to my adult children to help them understand investing fo Still slowly readings as I'm reading to learn. Completed first four chapters and value the information already covered. Practically Investing by Coreen T. Sol is a fantastic book! 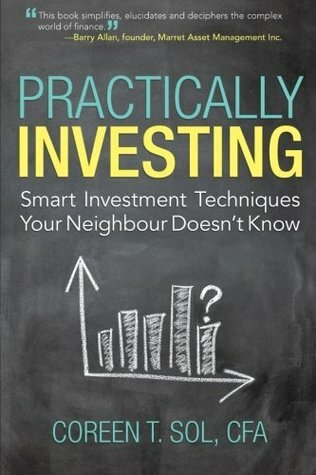 Coreen a CFA with experience in the field has crafted a terrific book for those that want fianancial knowledge and are curious about investing. Not only that but i think that a great deal of people would be intersted in this book due to the excellent writing. The book is jam packed with examples, charts, definitions,fiancial information,numerous ways to invest your money and much more! Stocks, RRSPS,Mutual funds,etc its all covered in t Practically Investing by Coreen T. Sol is a fantastic book! Coreen a CFA with experience in the field has crafted a terrific book for those that want fianancial knowledge and are curious about investing. Not only that but i think that a great deal of people would be intersted in this book due to the excellent writing. The book is jam packed with examples, charts, definitions,fiancial information,numerous ways to invest your money and much more! Stocks, RRSPS,Mutual funds,etc its all covered in this book. There are personal examples told by Coreen and another aspect i personaly enjoy is the fact that there are quesions in the book that one may ask themselves and than they are answered by Coreen, backed up by useful information. The glossary at the end is very useful for those that are new to investing which makes this book appeal to a wide audience. New investors and more expericened investors would all benefit from this book. What makes this book very enjoyable is the fact that it is written like a script/story it feels like someone is telling you this information at times and thats a fantastic aspect to the book! If you talk to a fiancial advisor they might tell you stuff like this. But this book is full of even more great information and very nice charts which help the reader to enjoy the book and learn a lot in the proccess. All the questions that you have about finance and investing are answered in this book which is reinforced by charts, examples and personal advice! I strongly recommend this book to people who are interested in finance and investing or even people who just want to enjoy a good book while learning alot in the process! Practically Investing by Coreen T. Sol is an amazing book and i highly recommend it! 5 Stars a fantastic read! With the new year, it’s a good time to read this book and follow through on some of Coreen Sol’s recommendations to improve our financial well-being. Although I started reading this book some time ago, I find that we can read various chapters that strike our interest and continue later on. I find this enhances the understanding of her useful advice. The chapter on “Alternative Investments: The New Frontier” was of particular interest. The details provided give the reader a general understanding With the new year, it’s a good time to read this book and follow through on some of Coreen Sol’s recommendations to improve our financial well-being. The chapter on “Alternative Investments: The New Frontier” was of particular interest. The details provided give the reader a general understanding of these options, so that the new frontier is less intimidating. Thank you GoodReads for the helpful book ! Coreen T. Sol, Chartered Financial Analyst, is a Portfolio Manager with more than 20 years of experience in private wealth management and a passion for inspiring change and altering the way we invest. Beginning her career as a teller at the Royal Bank of Canada, she worked in a number of personal and corporate positions before managing a small community bank branch in New Westminster, BC. During th Coreen T. Sol, Chartered Financial Analyst, is a Portfolio Manager with more than 20 years of experience in private wealth management and a passion for inspiring change and altering the way we invest. Beginning her career as a teller at the Royal Bank of Canada, she worked in a number of personal and corporate positions before managing a small community bank branch in New Westminster, BC. During this time, Coreen was one of the first personal banker licensees in British Columbia to sell mutual funds to bank clients, in the mid-1990’s. From here, she went on to become an Investment Advisor at RBC Dominion Securities and, after receiving her CFA® charter in 2003, began managing discretionary portfolios on an industry unique platform. Today, Coreen administers her private wealth practice through CIBC Wood Gundy. Her work is built on the transparency of individual securities, quantitative models, and bulk trading. In a rapidly changing economic landscape of unpredictable markets and extravagant fees, Coreen hopes to guide and inspire a new league of both private wealth investors and financial professionals. Transforming the way we invest is her mission.